UGG Kids Butte II Camo Winter Boots. Waterproof leather upper with nylon shaft. Fully lined in luxurious, UGGpure wool. Removable sockliner for custom look and feel. Boys Youth Sz 3 UGG 3292 Light Beige Suede Oxford Fleece Lined Tie Shoes. Great pre-owned condition. Some signs of wear. If you are dissatisfied with your item or have any concerns. CONDITION: Pre-owned without original box. Toes show light scuff marks. Shoes are in pre-owned condition with light wear. Bottom soles show light dirt. Length (Heel to Toe): 9.25". Insoles: 8.25". BOYS NAVY UGG BOOTS, JUNIOR SIZE 1. Condition is Used. Dispatched with Royal Mail Signed For® 2nd Class. A side zip closure makes it easy to get on and off, and the adjustable laces help perfect the fit. 10mm UGGpure™ wool insole. Leather upper/genuine shearling (Australia) and 100% UGGpure wool lining/rubber sole. A PAIR OF CHILDREN'S LEATHER SHOES BY UGG AUSTRALIA. UGG S/N ~ 1010269K. UGG authenticity number ~ 42FX6LT2YY. A tan brown pair of UGG shoes, which are suitable for a girl or a boy. Soft fleece inner base for a more comfort fit. Length (heel to toe)-6.75". Bottom soles are slightly dirty and show signs of very light wear. Heels and toes of both shoes show no wear and are very clean. Insoles and inner lining are slightly dirty and show very little wear. Made for winter adventures, the Tamarind features waterproof leather and suede, a plush wool lining, and treaded rubber sole. US 10 - UK 10 - EU 28. Waterproof construction. Rubber outsole. Hook-and-loop closures. The bottom soles are dirty. The sides, toes, and heels are dirty from wear. Width: 3.5". Insoles:9". UGG Authentic new in box boys shoes US size 12 black color . Condition is New with box. Shipped with USPS. boys ugg boots brown size 2. Condition is Used. Dispatched with Royal Mail 2nd Class. P a i r o f K i d s U g g H a r t w e l l B o o t s. T hanks for looking. P lease look at the photos carefully. Ugg Australia Ascot Kids Slipper US Size 1. Chestnut. Suede and wool upper with Ugg pure lining and rubber sole. Condition is Pre-owned. Shipped with USPS Priority Mail. From a smoke-free and pet-free home. 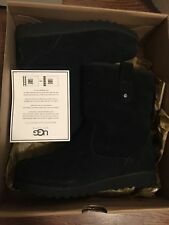 100% AUTHENTIC WITH HOLOGRAM AUTHENTICITY UGG AUSTRALIA ORIN. THESE FEATURE TOP QUALITY BURNISHED SUEDE UPPERS. UGG AUSTRALIA TAB TO THE BACK OF THE HEELS. THESE ARE A SUPER PAIR OF UGG'S WITH A HARD WEARING WINTER TREAD SOLES. Circumference: 12.75". Left shoe is missing the laces. Length (Heel to Toe-Outer soles): 10.75". Length (Insoles):9". Bottom soles are dirty. Shaft: 10". The photos show exactly the condition of the shoes no return UGG AUSTRALIA YOUTH 2 BROWN SUEDE LACE WATERPROOF EVENT BOOT SIZE 1 ANKLE . Condition is Pre-owned. Shipped with USPS Priority Mail. For sale nice Ugg Boys Kaylen Leather Boot - Big Kid - US 3 - EU 33. - Round toe - Contrast leather construction - Lace-up vamp with hook-and-loop vamp strap closure - UGGpure lined footbed - Grip sole - Imported. Ugg butte boots size 2y good condition. The smart and stylish UGG Schyler High Top takes your child's casual look to the next level. Reflective heel counter. 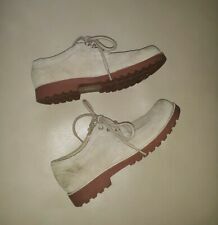 Soft upper with synthetic collar. Upper: Suede/Synthetic or Suede. Texturized molded rubber outsole. Style: Lidvig. Boy Toddler. These are snow boots therefore a substantial size Snow Boot. Snow Boots.